American Presidents do not praise the sham elections of foreign dictators. Fuhrer Drumpfenfarten, aka Putin’s Piddle Puppet did, but the Fuhrer is a Resident, not a President. I think I know why he did so, and ignored the Russian murder of two people in Great Britain, even though his own national security staff warned hum, "DO NOT CONGRATULATE!" After a previous election, then-President Obama did congratulate Putin on his election. However, the circumstances were very different. We should know this in order to be prepared should a grumpy uncle bring it up as othsiderism. Incidentally, that Russian professor who was lookng for fodder for them was specifically targeting dark triad people. I just must throw in that, as you have probably seen, Trump sent a tweet or tweets condemning the "Special Council" (who, as WE know, is not a "council" of people, but one "counsel") finding crimes "wether" crimes exist or not. Just to clarify, a "wether" is a neutered male sheep. He must have been confused and mixed the investigation up with the abused goats which Islamaphobes are always on about. Let’s be honest, Jean-Claude Junker, president of the EU parliament, also congratulated Putin on his re-election, which was condemned by many in the EU. But then Junker is on his last legs as president and seems to have lost the plot, doing the strangest things. Power corrupts anywhere. Drumpf, however, is another matter. He’s been told many times that he’s far to nice to Putin and congratulating given the global situation would make him look bad. But he either can’t help himself, blurting out the most inappropriate things in his usual fashion, or he had to play nice as expected from Putin’s favorite lapdog in need of pleasing his master. I think it’s the combination of both. 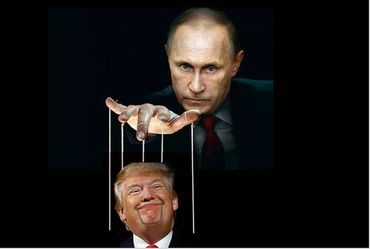 Drumpf is beholden to Putin for whatever reason we might never learn, but somewhere in the back of that empty cranium Drumpf really thinks that Putin is his BFF and refuses to knowledge that Vlad is playing him for the stupid puppy he is, who will dump him if Drumpf gets to be too much of a liability. If I were Drumpf I wouldn’t invite any Russians over for coffee or tea, or even a diet-coke any time soon. Thanks for sharing. I thought he'd been specifically instructed not to offer congratulations! We face dark times as two tyrants and the stooge to one of them are the most powerful people on the planet. However, we are a tough and resourceful species, and there will always be enough who value liberty and justice. It takes only a small percentage of the populace to topple a dictator. Hope for the best, but gird your loins just in case. The should have told him in caps to please congratulate Putin. He seems to do the opposite of what he is told. Noted, forwarded and shared ultra-liberally across four networks!!RESIST! !Thanks for sharing, TomCat!!! But, wouldn't you just love to see those pee pee tapes? So much going on, and tDump is just scrambling for his special way out. You know, if someone had written a political novel describing this 10 years ago, we'd all have called it totally implausible! And tDump is following his intuitions, just as he said he would, just like Mussolini! When i Putin's birthday/ Is he going to call tDump to come over and give him a "special" gift? Yes, Mitchell...I WOULD LOVE TO SEE THOSE TAPES! Think it'll ever happen? We should have Expected Him no to follow order's he can't even follow a speech! But sometime he may really SCREW it all up if Not already!! he is acting like Putin is Best friend!! NOT GOOD for all! Thanks, TC ! Great image, too!!! What concerns me more, is what we DON'T know. If this is the tip of the iceberg, then what's beneath the surface would rattle our bones~ The man has always put a knot in my belly and each day I am more concerned than the previous,.... Shakespeare couldn't write anything this deep in human folly and error. Are we learning anything from this??? That will be our hope for the future~ Learn, grow stronger, and correct as much as possible. There are still the hardheads who will defend Trumpelstiltskin, and may never comprehend his deceptions. However, the number of those who are seeing his flaws is getting larger, and with 'right' actions, our nation can right itself from much of the corruption inspired by greed, power-addicts, and pure narcissism at the helm. Putin is gleefully cheering ignorance of the US. Putin is a serious danger to our world, and Trumpelstiltskin is the fool who plays with the devil. It confounds me that there are still those people who think Trump was a better choice. I just spoke with a woman from AZ a couple of days ago who was scared that Hillary would take away her gun. To her, that was terribly frightening??? She was around 65 or so, didn't appear to be in great physical condition, and I shudder to think of her reeling a gun. She appeared oblivious to Trumpelstiltskin's flaws. To me, it is that kind of mentality that makes me shutter with the possibilities of how the future could unfold. Putin's study of the American mind, paid off. With the Mid Terms coming, it behooves us to remind the incumbency that their lack of oversight will have consequences. Allowing the victimization of our countrymen, looking the other way when illegalities, immoralities, unethical behavior and treasonous activity dismantles national prestige at the highest levels of our government as well as the democracy enshrined in our constitution that should not be tolerated much less rewarded with the prestige and privilege of continued presence in our representative government. Third world fascism will not cut it. Sharpen your pencils and get out your best stationary, time to fire a salvo and let 'em know who's really boss, in this our democracy. Jail is too good for tRUMP . . . . . . I was just reading in the NY Times that John Dowd has resigned as one of Drumpf’s lawyers. According to the story, Dowd had been considering the resignation for sometime because Drumpf does not accept his counsel. Apparently Dowd was not aggressive enough with the Special Counsel for Drumpf. The time for Drumpf to pack up and leave the WH is long overdue! Drumpf is his own worst enemy! May he rot in prison!!! A co-worker e-mailed that news of John Dowd, fed up, and out the door!!! I think that friendly congratulations to the POOTin was the last straw. Love to see 'em all turn tail and run like wild things out of the WH of horrors!